Upon arrival you will step into your home away from home. Enter through the door via keyless pad; for easy self check-in. 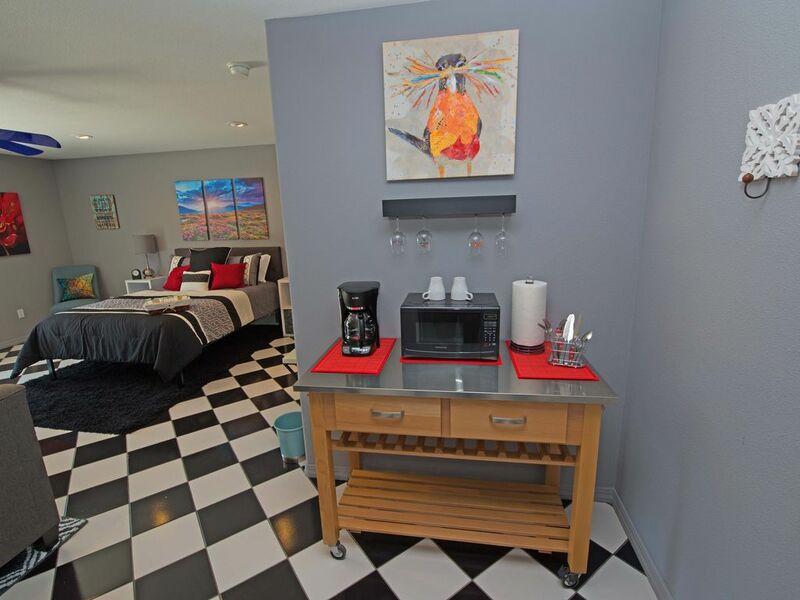 Walk in to see your queen sized bed, a couch, a 48" smart TV, coffee table with games, sitting table, microwave, coffee maker, full bathroom with amenities (soap, shampoo/conditioner), fresh linens, and a private back patio with Adirondack chairs to sit and relax with a good book or a great glass of wine. Enjoy the peaceful atmosphere watching the amazing sunrises and sunsets. The stargazing is spectacular on clear nights. There are several deer and their babies that graze around the property; and occasionally if you get up early enough you may see "Goldie" the red fox meander through the property. You may hear a few birds throughout the day and you will definitely see lots of hummingbirds. Large private back patio with small table and two chairs along with two Adirondack chairs for relaxing. The area is known for wine tasting and more wine tasting. Plan your wine tasting adventures for the Paso Robles and Templeton area. Or plan a visit to the ocean or the famous Hearst Castle. Perfect location with a cozy suite! My boyfriend and I came to visit friends in Templeton for the weekend. We loved our stay! The location was perfect for where we were seeing friends and close to restaurant! We have already told friends and family about this VRBO and we hope to find more reasons to come back! Thank you Michelle for your wonderful hospitality! Super cute place with a great private backyard area- you feel like you're out and away, yet everything you need is less than a 15min drive. Place is well equipped and very comfortable. It's a great place to get away.